RANGERS turned in a professional performance at Lowland League outfit East Stirlingshire this evening as they made it three wins from three in the Betfred Cup. First half goals from Andy Halliday and Josh Windass allowed Mark Warburton’s side to flick the cruise control switch for the second period before new signing Joe Dodoo stepped off the bench to grab the third goal of the night in injury time. Against non-league opposition for the first time in a competitive match since they faced Forres Mechanics in the Scottish Cup in 2012, Rangers immediately showed their superiority by, as ever, taking complete ownership of the ball and creating a number of chances. Josh Windass might have done better inside two minutes having been fed by Michael O’Halloran just inside the area, but he fired wide under little pressure from the Shire defence, before Harry Forrester dragged a similar effort off target after beautifully collecting a Kenny Miller ball over the top and Windass was then denied by the linesman’s flag after mistiming a run through. The one-way traffic was only going to lead to one thing – a Rangers goal – and sure enough it arrived with 10 minutes on the clock, albeit from the penalty spot. 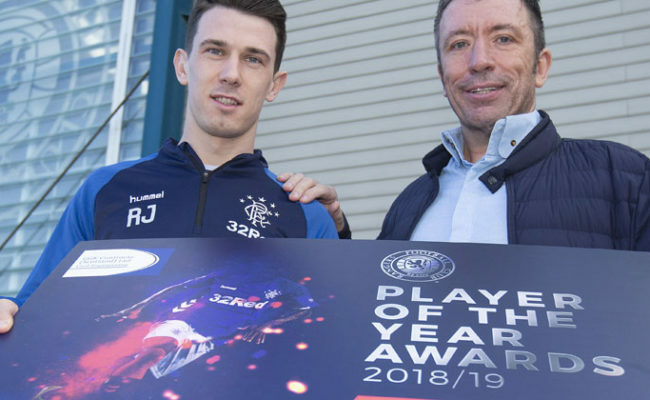 Barrie McKay made a searching run into the penalty area and showed good strength to hold off the advances of Connor Greene before the defender inexplicably hauled McKay to the deck, leaving referee Crawford Allan with no option other than to point to the spot. 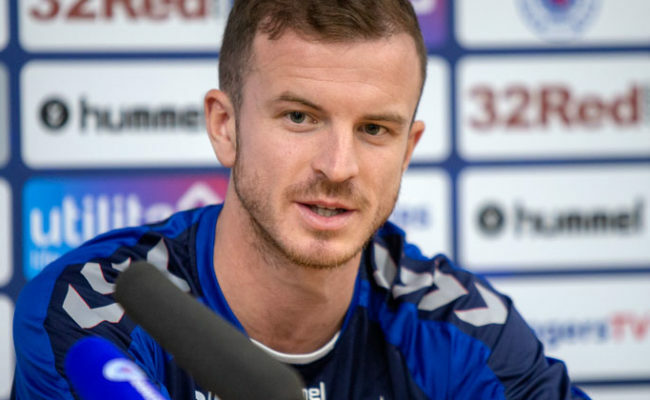 Up stepped Andy Halliday – who missed his last effort from the spot against Alloa at the tail-end of last season – and he fired well into the corner of the net despite goalkeeper Darren Dolan guessing correctly and diving to his left. The standard Rangers performance under Warburton where they had almost exclusive use of the ball then swung into action, and through that, the chances continued to mount up. Barrie McKay was having a field day, and he played an utterly sublime ball from midfield, over the Shire defence and into the path of Forrester on the right wing for him to lay on a plate for Kenny Miller only for the home defence to somehow recover and turn the ball away for a corner. Forrester and Miller then combined again, with the Englishman teeing the ball up to the back post for the Scotland legend, but he could find only the arms of Dolan who acrobatically threw himself to claim the striker’s effort. 10 minutes before half time, the second goal Rangers play deserved finally arrived, and it was a first competitive goal for Josh Windass as he added to the friendly strike he has from earlier this summer against Charleston Battery. From the left wing, the outstanding McKay delivered a delicious ball into the area, but at first Windass seemed startled to find it at his feet. He quickly found his composure though and slid the ball beyond Dolan to put his side in the clear. And their cushion should really have been more going into the interval with Kenny Miller guilty of a quite awful miss. Lee Wallace careered into the area in typically powerful fashion, sent the ball beyond the advances of Dolan and into the path of Miller 10 yards out, but somehow, he fired over the bar with the entire goal gaping. Into the second half, and while Rangers still played Monopoly with the football, there wasn’t too much to report in the way of chances. That said, a sublime piece of McKay skill saw him turn Adam Murray inside out on the left channel before he fed Forrester, but he could only find the side netting with his effort. Youngster Jordan Thompson was given the last 25 minutes to show what he could do, and he forced Dolan into a smart save with a 25-yard drive before fellow sub Niko Kranjcar poked a near-distance volley wide of the target when Dolan parried a Hodson shot into his path. There was also a first appearance for Joe Dodoo in the blue of Rangers following his switch from Leicester City earlier this week, and he immediately fitted into the Warburton way of play, popping up in the central, right and left positions of the front three. 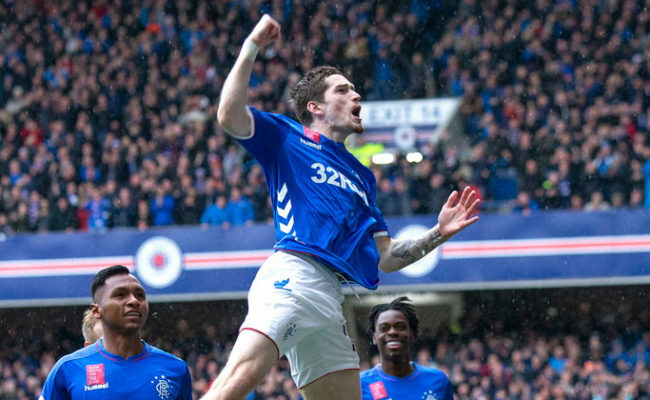 Then, in the first minute of stoppage time, he made his debut a perfect one by grabbing his first Rangers goal. Lee Wallace charged down the left as ever, cut the ball across the goalline, and there was Dodoo to tap home and set the seal on victory. Victory over Stranraer on Monday night at Ibrox will see Rangers win the group, and with seven goals scored so far and none conceded, another handsome win in Govan should also see the Light Blues go through as one of the four best group winners, and therefore be seeded for the second round. RANGERS: Gilks; Hodson, Hill, Wilson, Wallace; Halliday, Forrester (Thompson, 65), Windass (Kranjcar 45); O’Halloran (Dodoo, 60) Miller, McKay. SUBS NOT USED: Foderingham, Hardie, Waghorn, Kiernan. EAST STIRLINGSHIRE: Dolan, Greene, Murray, Grant , Fisher, MacGregor (Comrie, 66), McGuigan, Ure, Faulds, Grant (McMillan, 71), Hogg (White, 83). SUBS NOT USED: Buist, Peddie, Shaw.